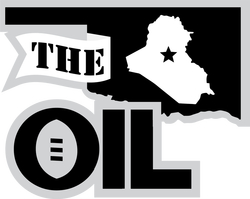 Until 2016, the managers of the OIL's NFC competed for the Harrington Trophy. After each season, the champion's name is engraved into the trophy and he keeps it in trust until a new champion is crowned. The trophy was named for Nathan Harrington. It is now named after SFC Isaac S. Lawson. Who is Nathan Harrington? In short, Nathan Harrington is a champion, but not just any champion. He was a man who had three things of value in his life: a job; a roof over his head; and fantasy football. When his injured back required surgery, the first thing of value, his job, was lost. Soon thereafter, his apartment was condemned and he had no money for a new place. After losing two of the most important things in his life, a homeless Nathan Harrington could have had every excuse in the world to throw in the towel on fantasy football. But did he fail to set his lineup? Did he forget to work the waiver wire? Hell no. Homeless Harrington asked to use former neighbors' computers. He went to the library. He stopped in at his parents' for a quick add/drop here and there. 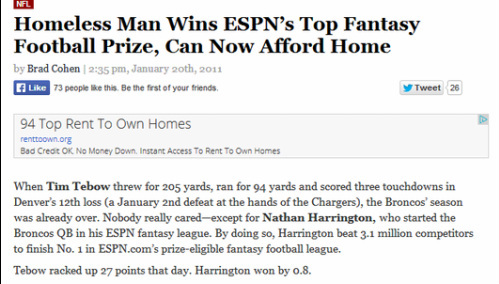 He did what he had to do, and, when the dust settled, Nathan Harrington not only won his ESPN fantasy football league's championship. He won the entire ESPN fantasy football site's championship, beating out over three million other ESPN fantasy football users. That's right: a homeless man beat every other manager on ESPN's fantasy football site. That is dedication, and that is why the OklahomIraqis League trophy was named after Nathan Harrington, the Champion's Champion. The Harrington Trophy was produced by the good folks at SculptureAlley. For more on Harrington, click here. 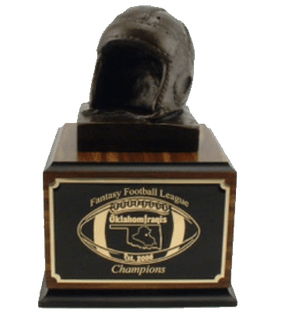 Go to SculptureAlley.net to decide which traveling trophy your fantasy league should award. Tell them the OklahomIraqis League sent you. If you already have a traveling trophy, click here to order your detailed engraving plates.